May Bernadet “Bernie” Kiss was born October 24, 1936 in Edmonton, Alberta. 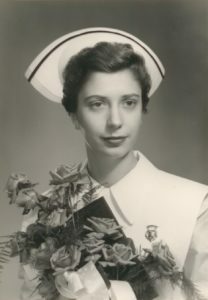 After graduation from the Edmonton General Hospital in September 1957, where she was class president, Bernie spent a brief time in Spokane before returning to Edmonton with Edward Paul Ratsoy, whom she married April 19, 1958. She practiced in Obstetric Nursing at the Misericordia and Edmonton General Hospitals until 1960, when she moved with her husband to Vancouver. Beginning in 1966-1967 she was clinical Instructor in Obstetrics in St. Paul’s Hospital School of Nursing. 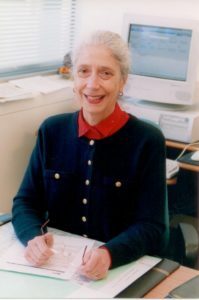 As Coordinator of Obstetric Nursing from 1968 to 1979, she developed and implemented the first family centered maternity care program in BC, and was co-director of the Vancouver Perinatal Health Project. Here she was responsible for infection control, ambulatory services, obstetrics, rehabilitation, and pediatrics. After graduation with a BSN in 1968, she became Clinical Coordinator at St. Paul’s Hospital until 1979. Between 1975 and 1981 she studied part-time at UBC, completing a Masters Degree in Health Services Planning. As Vice-President of Nursing from April 1979 to November 1989 she was responsible for assuring quality of care in a department of over one thousand professional and non-professional staff. From 1983 to 1985 she was also president of the Registered Nurses of British Columbia, a spokesperson for 27,000 registered nurses. She was nominated for a YWCA Woman of Distinction award in 1988. Briefly, from 1990-1991, she served as Executive Director of the Alberta Association of Registered Nurses, where she was responsible for the administrative, legislative and professional activities of the association. She subsequently returned to Vancouver, and from 1991 to 2002 was Associate Dean of Health Sciences at the BC Institute of Technology. Here she was responsible for the administration and educational leadership of the Nursing and Specialty Nursing programs, Biomedical Engineering Technology, the Prosthetics and Orthotics and the Occupational Health and Safety Programs. She received the RNABC Recognition Award for valuable contributions to the nursing profession in 2002, and a Lifetime Achievement Award from the Health CARE Leaders’ Association of BC in 2003. Bernie’s many accomplishments include the development of a family centered maternity care program and the initiation of a three year prenatal health research project. At St. Paul’s she was responsible for infection control, ambulatory services, obstetrics, rehabilitation and pediatrics. At BCIT she initiated nursing specialty courses such as Critical Care and Emergency. She responded rapidly and effectively to the AIDS epidemic in Vancouver, developing nursing care and staff protection programs. She has had over fifteen publications in books and recognized journals, and was often invited for public speaking engagements. She died in 2009. Fonds consists of one box of textual records and photographs dating from 1955 to 2009 related to Bernie’s varied nursing activities. Incoming and outgoing correspondence document her many professional involvements. She published numerous articles, particularly in the RNABC News while she was President of this association, and made many presentations. A folder of newspaper clippings relate to her presidency of the BC Nursing Association and her appointment to the position of Executive Director of the Alberta Association of Registered Nurses; another folder describes her work at BCIT. Her numerous awards are also documented. The photographs, which further describe her activities, have been transferred to the photograph collection, and the artifacts to the artifact collection. Audiotape interviews on her life are also available.